In 1905 Isaac Slutzky moved from Manhattan’s Lower East Side to work on a farm in the Northern Catskills. Within a few years he bought his own land and began to raise his family. In 1909 his oldest son Israel was born and his younger brother Orville was born in 1917. Israel and Orville developed a love for skiing early in life. They fashioned their own skis, which they attached to their boots with leather straps. They climbed the gentle slopes of the farm and slid down. By the mid-1950’s the sport of skiing was gaining popularity in New York and across the northeast. A group of businessmen, lead by Orville and Israel, developed plans to create a ski resort at Hunter Mountain. They lobbied New York state to push the project forward. State-run Belleayre Ski Center had opened a few years earlier, and was attracting a fair number of skiers each winter. In 1957 and again in 1958, the state studied the idea of opening a second ski area, but concluded that Hunter Mountain was too steep and rocky. Project backers sought investors through other means including soliciting developers through advertising in the New York Times. This effort was also unsuccessful. Orville and Israel came up with another idea. They contacted Denise McCluggage — a sports editor at the New York Herald Tribune — to pitch a story. They proposed giving the land to any developer who would build a ski area on Hunter Mountain. In the spring of 1958, Denise wrote the article for Ski Magazine about the town that had a mountain to give away, and had no takers. The article attracted a lot of attention, and investors, many from New York City, signed up to buy stock. The investors created the Hunter Mountain Development Corporation, the first operator of the ski area. Headed by James Hammerstein, the son of Oscar Hammerstein II, the corporation included Hollywood and Broadway stars of the time — Paul Newman and Joanne Woodward, Kim Novak, Morey Amsterdam and Chris Plummer. Construction started in the summer of 1959. Orville and Israel gave the land with two stipulations: that the project be named the “Hunter Mountain Ski Bowl” and that it was equipped with snowmaking which was new technology at that time. The Slutzky Brothers’ Construction Company built the facilities. Larchmont Construction installed the snowmaking and two Poma-Savio chairlifts. The old Starr Hotel was renovated to serve as the base lodge. 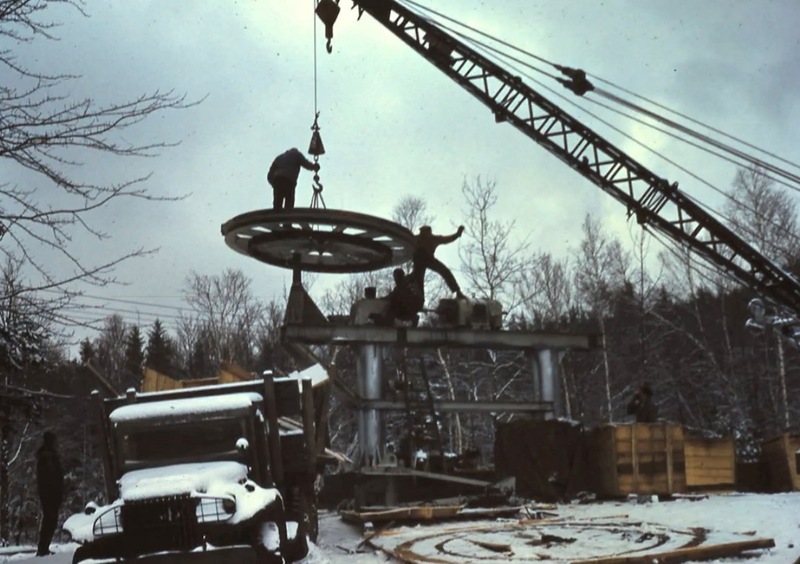 On January 9, 1960, Hunter Mountain Ski Bowl opened for the first time with the original “B” Lift in operation. The “A” Lift was still under construction and wasn’t ready for the first season. Hunter’s first snowmaking system had limited functionality, and a short 30-day initial season was followed by only 60 days of operation the second year. After three short ski seasons, few visitors, and mounting losses, the Hunter Mountain Development Corporation declared bankruptcy. But the Slutzky brothers were not deterred. In the middle of the 1961-62, season they took full control of the ski area. Hard work and consistent marketing yielded longer seasons and more skier visits. During the summer of 1962, the “A” lift was completed. This opened up the skiing to the top. Izzy and Orville were relentless innovators, who were willing to try new things. In 1963, they pushed the envelope again when Hunter opened for summer skiing on plastic chips. Summer skiing lasted only a few years. 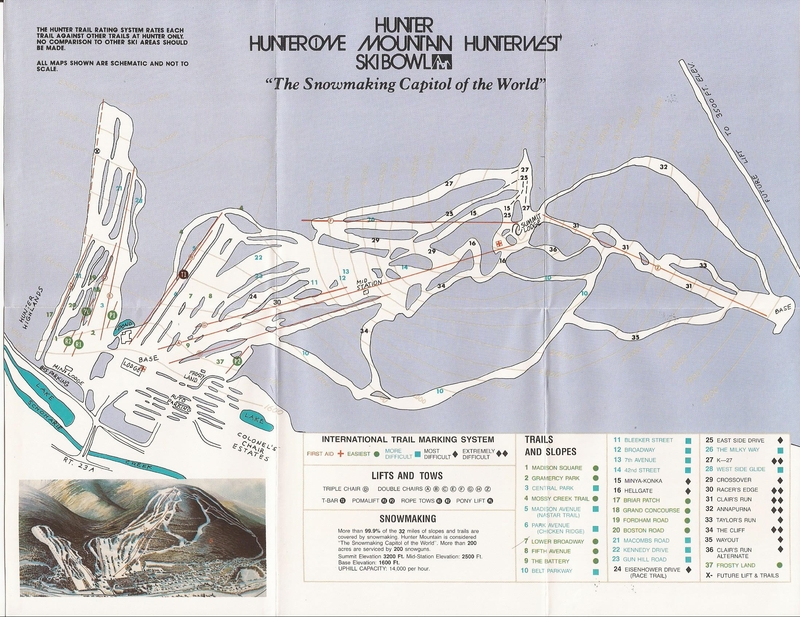 During the winter of 1963-64, Hunter Mountain opened for night skiing for the first time which continued until 1972. 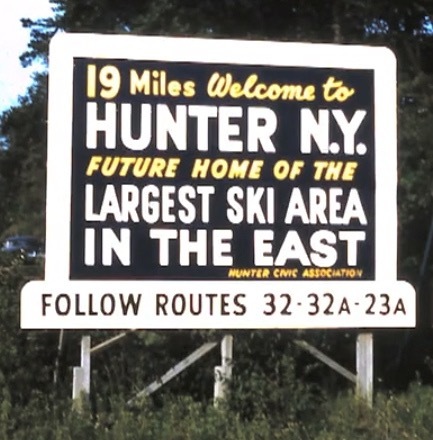 Hunter gained huge national exposure in January 1964, when Kitty Falger, a Hunter Mountain ski instructor, appeared on the Tonight Show to teach Johnny Carson how to ski. In the summer of 1964, construction of the present-day base lodge began. It featured a 300-seat dining room, an indoor swimming pool, sauna, health club, and massage rooms. The “D” Lift opened in December 1967, the first triple chair at Hunter Mountain. That winter, Hunter became the first area in the world with top-to-bottom snowmaking with the completion of water lines to the summit. In addition the “East Side” was developed including East Side Drive, The Milky Way and the steepest run on the mountain, K27, which averages 34 degrees over it’s full length. By the mid-1960s business increased dramatically. The brothers reinvested profits to grow the business. New trails were cut, including the opening of the Belt Parkway and more snowmaking was installed. In the summer of 1969, construction of the trails on Hunter West began. It was opened with the “Z” Lift for the season. With the addition of Hunter West, the area joined the ranks of the Northeast’s major mountains. That summer, the Summit Lodge was constructed. In 1980, Hunter Mountain became the first ski area to have snowmaking coverage on 100 percent of its trails. In the summer of 1987, The SnowLite Express Quad was built to replace the A Lift. In 1989, Hunter became the first area in the U.S. to install an automated snowmaking system. The system installed on Racer’s Edge by York International is operated from the Upper Shop. Hunter continued to upgrade in the 90’s, adding more lifts, trails and shops to the property. During this time there was renewed pressure to develop the mountain further. A proposed amendment the state constitution to trade land closer to Hunter’s true summit for holdings elsewhere was opposed by environmentalists and failed to pass the legislature. In 1999 Governor Pataki put the idea to rest by designating much of the Catskill High Peaks as Bird Conservation Areas, to protect Bicknell’s Thrush and other threatened bird species. In 2002 Hunter completed a new learning center, housing the ski school, ticket sales, child care facilities, equipment rentals and a cafeteria, all with ski-out access to Hunter’s beginner terrain on Hunter One. During the summer of 2010, Hunter replaced the Snowlite Express with high speed sixpack chairlift from Leitner Poma. 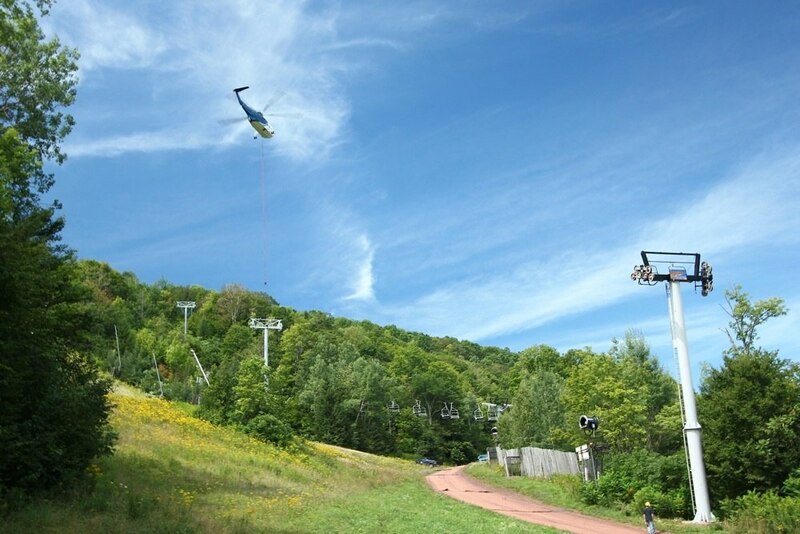 The following summer the mountain added another 150 new snow guns and made improvements to the terrain park. The biggest upgrade was the installation of a new high speed quad on the west side to replace the Z and Y lifts. The new lift was actually a reincarnation of the former Snowlite express, which had undergone extensive renovations and new station designs. Today, Hunter maintains it’s reputation as “the snow making capital of the world,” routinely opening terrain faster than most other mountains. After a warm start to the season in 2010 Hunter got 90% of terrain open in eight days. Hunter has become a lynch pin in the local economy and much of the commerce in the village of Hunter centers around the ski area and its year round activities. “The snow making capital of the world” …. It’s really the “the snow making CAPITOL of the world.” They trademarked this. Great job with the story! They really misspelled the trademark? That’s really weird. I wonder what the next chapter of Hunter holds in regards to the management and expansion. It’s such a success story in my mind, and still has so much potential going forward. Not they ever stop trying to improve things, like the six pack and west side high speed show… and maybe a new snowmaking pond for next year, too? Nice to see some of the background information coming further into print. Hunter began trail development the year after the Slutsky’s worked on Bearpen. The rocky aspect of this mountain was a topic of discussion shared between both brothers and Dr. Lane while Bearpen operated in 1958. Very well done. Thanks for this. The brothers are getting old, which means a change of ownership soon. One wonders what the future holds. I’d like to see some old pics of the lodge when there was a pool inside. It’s such a unique building. They still have that same Bulldozer! The austrian instructors of which kitty falger was one along with her husband willie, margo and karl platner (ski school) many a hans, heidi and my favorite dido graiff were all brought in to teach a barrage of novice skiers how to put their veight on zee down hill ski, good times were had by all! They are my fondest family memories for sure! Gary, we’re honored to have your comments underneath our piece. With regard to the spelling of your surname, our sincerest apologies. We did research the spelling and found it spelled both ways in countless places. We went with what we thought was the predominant spelling. The corrections to the spelling of your name have been made in the piece above, and the blog entry introduction. With regard to the rest of the valuable information you’ve provided above, we’ll take the time over the next few days to incorporate it into the piece, to improve the accuracy. Thank you for your input. With regard to the history of the mountain, the story of your father and uncle’s determination is inspiring, and it was satisfying to learn and retell it. Again thanks for your help in improving what we’ve written. We wish the best to the new generation of Slutzkys and for the future of Hunter Mountain. Izzy died several years ago but the ownership had already changed even prior to his passing, Hunter is owned by the 2nd generation Slutzkys; Paul, Carol, Gary, David & CB. Nicely done and thanks. I haven’t read through it completely yet, but in the very first sentence, I must correct a mistake. My grandfather, Isaac Slutzky had actually come to Hunter somewhere around 1905 as all his children were born here and Izzy, the oldest, was born around 1909. My father Orville was born in 1917. They were all born in Jewett and or Hunter and Isaac already had bought the land for his farm before any of the children were born. He ran a farm and boarding house with his wife Elke and children, called the New Sunny Brook House. Also, the last name is spelled with a ‘z’, Slutzky, a common mistake I’ve been correcting all my life and will likely continue to do so. My name is Barbara Kass and I was best of FRIENDS with Izzy Slutzky for over 30 years. I was shocked to see his birthdate as 1909. I believed that he was 94 when he passed in February 6 years ago.He had always told me Orville was 4 years younger than he was. Interesting to find out that men are as vain about their age as women are. We celebrated his birthday yearly at the mountain, as I always brought a cake. And even some years brought one for Orville. Can’t remember if that cake came a week before or after Izzy’s. Great job on the history of Hunter Mountain and I am delighted to hear it is still in the Slutzky family! I still remember when the the 2 brothers, Orville and Izzy would walk around the lodge cleaning up, and whatever they missed a big beautiful St Bernard would be walking around following them making sure no food was left around! I believe it was one of their dogs, always walking around the lodge. Yes, who could forget that pool in the middle of the lodge! Anyone remember Sol Goldman, who had a trailer home on 23A about a mile or 2 south of the mountain, heading towards Tannersville. How about a place called St James Infirmary, think it was a bar or restaurant. Hunter Mountain will always have a place in my heart, as will the Slutzky’s who brought great skiing to NY! Miss those $10 lift tickets too! Thank You and continued success to the 2nd generation Slutzky’s. Interesting that in Hunter’s preseason snowmaking video Hunter used “Snowmaking Capital of the World.” Check it out around :19 seconds. My father, Irving Miller, owned this land. His mother Celia Miller, Orville’s aunt, owned this from the 1920’s. When my father was ill he sold it to his cousins. I really enjoyed the slide show and the bit of history along with it. My husband and I rented many homes in the area since 1977. We then purchased a house in Prattsville on County Rt. 10. We skied nearly every weekend and spent our vacation days on this mountain. Sadly we sold our house in Prattsville and no longer ski, but those were the best times of our life. Really, Really Good times. Thanks for posting this bit of history. One mistake. Lower K27 is actually 44 degrees at the headwall, (but around 34 – 38 degrees throughout the rest of the run). Also, the top of the trail usually develops huge snowmaking mounds that don’t get groomed and thus make the top of the trail a ten – twenty foot drop in onto 44 degrees terrain for about 50 feet before it mellows out to the 30s. Jacob thank you for your comment. Our source for the pitch of K27 was synthasite.com which, as you note, reports the headwall at 44 degrees and 34 degrees over it’s full length. We’ve edited this part of our piece to be more specific. Joyce, please do. Thank you! Any info would be super appreciated.